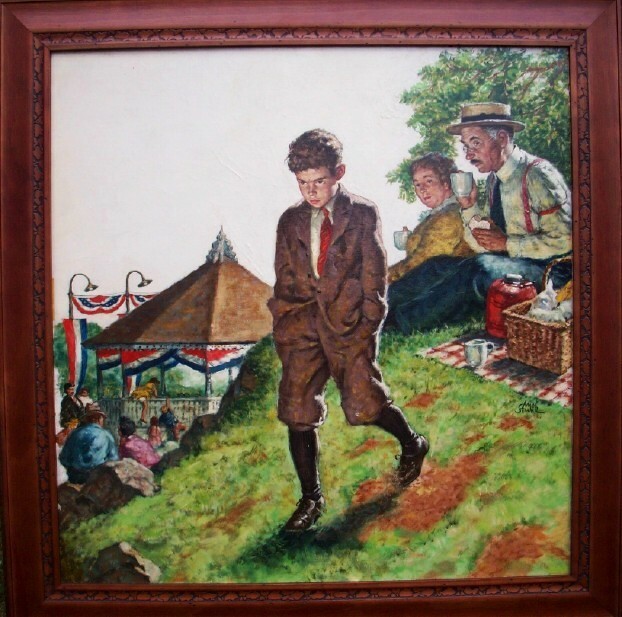 This oil on board painting created by Amos Sewell was most likely done as a magazine illustration. This image denotes the classic type of story illustration for which Sewell was known, as many similar illustrations appear in The Saturday Evening Post and The Country Gentleman. The setting for this illustration appears to be a 4th of July celebration, or possibly a county fair.. The young boy seen in the foreground seems to be upset about something, as he kicks the dirt. The older couple (possibly his grandparents) sit on the hill eating a picnic lunch, watching his actions. All the while, there is a flurry of activity in the background as children scale the fence of the gazebo. You can almost get the feeling of being there because of the older couple's focus on the young boy and the activity in the background. Sewell was known for the "Americana" hometown images that he created, and this painting is about as homespun and rural as it gets. Amos Sewell was born in San Francisco, California in 1901. Sewell was a nationally-ranked tennis pro during his twenties, but quit the sport after several degrading defeats. He was a Grand Slam winner of Wimbledon and the championships of Australia, France, and the United States-in 1938. He studied art at night while attending the California School of fine Arts. His day job was that of a bank teller. He knew that to become an illustrator, he would need to move east, and shipped out as a working hand on a lumber boat going by way of the Panama Canal. In New York, he studied at the Art Student's League and the Grand Central School of Art under Harvey Dunn. In 1932, he married the former Ruth Allen, and moved to Westport, Connecticut. Sewell enjoyed creating illustrations with children, which served him well, as he illustrated for The Saturday Evening Post and Country Gentleman Magazine. His only Country Gentleman cover painting titled, "Eyeing The Pies" appeared on the January 1, 1945 issue of the magazine. This was an illustration of a man bringing in firewood, stopping to admire two pies cooling on the kitchen table. His first illustration for The Saturday Evening Post, titled, "Dog Pound" appeared on the cover of the magazine on September 17, 1949. This was an image of a young boy choosing his first dog from the pound as his father looks on. He continued a close relationship with The Saturday Evening Post, and illustrated 45 covers between 1949 and 1962. He achieved recognition as a wartime artist and won a special art award for his war bond ad illustration, "What's It Like to Die?" Amos Sewell passed away in October of 1983.